First discovered in 1823 by Dr. Anton E. Sauter, an Austrian botanist, in Lake Zeller, Austria. 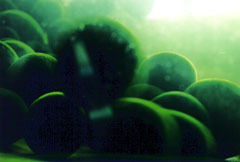 The bottom of Lake Akan is inhabited by miraculously spherical algae called "marimo." Although marimo and its related species are observed in the lakes of several European countries and in some other lakes in Japan, only in Lake Akan marimo grow 20 to 30 centimeters (8 to 12 inches) in diameter and have a spherical surface that is beautifully soft and smooth like velvet. Photos: Lake Akan in summer and winter (above); velvety marimo in the water (below). (Hokkaido Tourist Association).